The 2018 Rotaract Outstanding Project Award recognized the Rotaract Club of Edulink International Campus, Western Province, Sri Lanka, for a project that teaches entrepreneurial skills to women with HIV to empower them to earn a living. The club created the Dream Store online platform, where the women can sell products they make and have their earnings go straight to their bank accounts. After meeting with the women to assess their abilities, the club partnered with local experts and Rotarians to expand the women’s skills or teach them new ones. The women also received training in basic business and personal finance. The club arranged with several leading companies, including the largest gift shop in Sri Lanka, to carry the women’s products to ensure they had a customer base. The club hopes it can remove some of the stigma around HIV and AIDS by allowing the women to showcase their talents, giving people a way to support them through commerce, and holding events aimed at educating the public about the disease. Rotaractors assemble food boxes for Rise Against Hunger during the European Rotaract Conference. The award for best multidistrict project went to the European Rotaract Information Centre, a multidistrict organization that promotes collaboration and development of service projects among 115 districts and 24,000 Rotaractors in more than 45 countries. The organization compiles project descriptions and uploads them to a library, where results can be shared. A “twinning accelerator” serves as a search engine to connect clubs with mutual interests in service and friendship. For this year’s awards, more than 470 projects were nominated in 59 countries. In addition to the best single-club project and multidistrict project, the awards recognized outstanding service projects in each of six geographical regions. The best single-club project and best multidistrict project receive $1,000 each for future service activities, and members are invited to inspire other Rotaractors and Rotarians at the Rotaract Preconvention in Toronto, Ontario, Canada. The following clubs also earned awards for the best service projects in their regions. With the Mini-Hackathon and PechaKucha Project, the Rotaract Club of Makati San Miguel, Makati City, Philippines, brought together information technology professionals, business leaders, coaches, and community members to develop new apps that would solve community problems. Three prototypes were tested and proved to be functional at the event, and they continued to be developed afterward. One app allows users to find hospitals, evacuation sites, and fire stations during an emergency. Another app builds résumés for participants at a job fair and connects them with compatible employers. The third app reroutes supply trucks during a flood to reduce response times. Members of the Rotaract Club of The Caduceus, India, coordinate a medical check-up for families of workers involved in the coal and mining industry. The Rotaract Club of The Caduceus, Maharashtra, India, launched the Ground Reality Journey project to combat the negative impact of coal mining in their community. After working with local organizations, the government, and villagers, they offered medical examinations, installed waste segregation systems, conducted health education seminars, planted trees, and raised money for school improvements. Students celebrate after receiving their bicycles from the Rotaract Club of Hippocrate. Before, the students had to walk 10 kilometers a day to school. 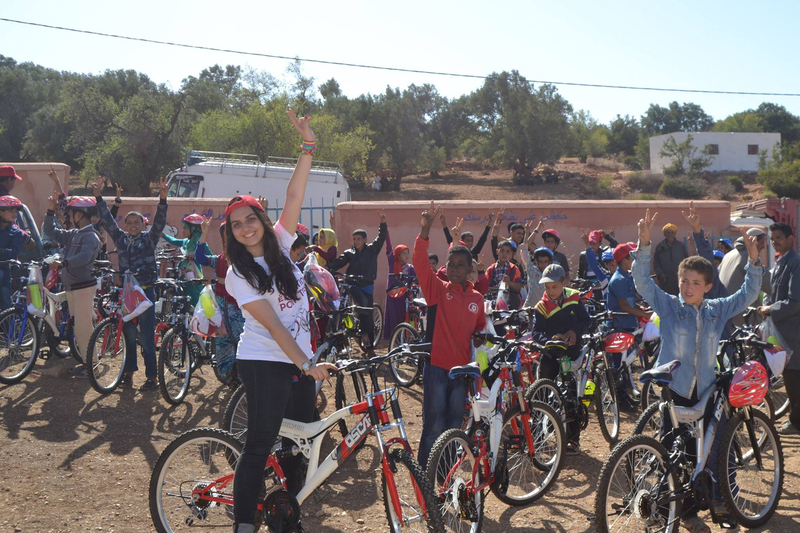 After learning that students in the rural community of Imintlit, Morocco, typically had to walk 10 kilometers (6.2 miles) to school, resulting in a high dropout rate, the Rotaract Club of Hippocrate, Morocco, launched Action Velos, a program to raise money to buy bicycles and distribute them to the students. Within a year, the dropout rate had decreased from 45 percent to 23 percent. Youth receive training in entrepreneurial and job skills as part of the Rotaract Club of St Jude’s Arusha’s project to empower unemployed youth to find jobs. The Rotaract Club of St Jude’s Arusha, Tanzania, led workshops for 12 unemployed youth as part of the project Rotary Vijana Poa, teaching them a variety of job skills as well as how to make soap and juice. With the help of Rotarians, the club then placed the youth in three-month paid internships with local businesses. Six youth were employed by the businesses at the end of the program, and two started their own businesses to serve the community. The Rotaract Club of Belo Horizonte-Leste, Minas Gerais, Brazil, partnered with community members and volunteer teachers on Doareduca, a project that offered college entrance courses and exams to students preparing for college. The students also took part in extracurricular activities like visiting museums and art galleries. The Rotaract Club of New Kingston, Jamaica, partnered with Rotarians and health professionals on its Back to School Medical project, which provided free medical exams, dental cleanings, and eye screenings for students returning to school in several underserved communities. Parents also received education on a variety of health topics. Want to make a difference in the world as a Rotaractor?